Irene and Terry have owned a hairdressing salon for years, never cut the hair of anyone famous but always do a good and reasonably priced job. I hereby nominate them for the Socklet Hairdressing Couple of the Year! Watch her though, Terry,. She's got a wicked sense of humour! In our house there is often a last minute rush and rant in an attempt to find where the remote controls for the TV, DVD player or Cable box have gone before the desired programme comes on. "Where did you sit?" "Who was watching last?" etc. Hi, I'm a Shouty Man and I'm here to tell you about NEW TV remote Pockets! I hunted through the mountains of scrap fabric I have accumulated and made this. An upside-down Marmite jar is rather skull-like in shape so, with the help of liquid chalk pens, it became just that! Our son loves playing Little Big Planet and his favourite levels are the ones set in this kind of environment: the wedding, the darkness, the skulldozer. They are beautiful, atmospheric and kind of 'friendly-creepy' if that makes any sense? Being Autistic, he tends to replay certain things quite a lot (understatement) so I was well steeped in this genre at the time. Ever heard the expression 'eyes bigger than your belly'? Well this Socklet not only has eyes bigger than his belly but cutlery bigger than his entire body!!! I found some more mini skateboards so now the original skateboard dude is no longer alone but has a posse. Of course I do not recommend the trick of riding a skateboard across a friend's head. This is not a recognised move and will earn you no points in competition. The guys are well colour coordinated and hang about in the skatepark till the sun goes down. Now Will Turner is RUSSIAN??? As promised, here are the pictures on the other side of the Pirates of the Caribbean Russian doll set. They are Will Turner, Davy Jones, Elizabeth Swann (as pirate chief). Sao Feng and Giselle. For details of how they were made, check out the previous blog (20th April). Melody Malone, Amelia Williams et al. I love books! I love looking at books, reading books, listening to them, finding them in episodes of Dr Who, giant ones in Pirates of the Caribbean and tiny ones that fit in a matchbox. So combining at least 2 of the above... here are mini books I made yesterday from Dr Who. images on the internet. It would be awesome (and creepy) if I woke one morning and found the words in them in miniature print! I copied, pasted, shrank, printed and cut round the little cover images. Then I stuck card on the back the same size as the cover image: front back and spine pieces. I cut off the corners and folded the edge pieces round tightly and glued them. Then I cut and sewed pages to go in the centre, glued the front and back pages to the inner front and back cover and then generally bent the book around a little to make it less stiff. Result: 4 books from a miniature Whovian library... each about the size of a 50p piece. ...there's a sign on my door..." or so the song goes. These two socklets are chilled and ready to spend quiet hours on a deserted peninsula they know and either fish or pretend to fish while they get away from it all. While we're on the subject of Russian dolls... this is a set I made as a Christmas present for someone. They are snowmen but only one is the traditional sort, while all the rest are a vicious band of blood-thirsty Pirate-Snowmen. I LOVE Russian dolls: the ones that get smaller and stack inside each other. There are sites where you can order blank ones and decorate them yourselves. I did this when I was deep in the Jack Sparrow phase and this is the result. There's Jack, Barbossa, Tia Dalma, Mr Gibbs and Scarlett. I drew them out first in pencil, went over in ink (see pic below) then shaded in detail and finally a watered down ink wash where I wanted some depth of colour. There is a different set of characters on the back which I will blog another day. This is the first showing of a Pirates of the Caribbean related craft-exploit...but it is one of many that will pop up from time to time as Jack was, for quite a while, my muse. Not Johnny, but definitely Jack. ...and still meet up every Friday for a kick-about... and a few pints in the pub afterwards! "That woman never stays still at anything crafty for long...how does she remember all the things she want to have a go at?" I hear you cry! Well I don't hear you cry anything of the sort...and I wouldn't remember all the ideas I have to try out...but I have THIS! It's my "diary of things unlikely to ever get made...but you never know" book, bought from Camden Market many years ago and full of stuff, some of which I make, date and tick off, some of which I grow out of enthusiasm for and some of which may never get tried. Its like River Song's book of meetings with the Doctor..all from different time zones and I can't show you what's in it, cos it's full of SPOILERS. Actually I did try this but have no idea where the finished cupcake went so I can't show you...sorry. and the Marmite baddie from the latest spy film, stroking his pot of Marmite and purring "I've been waiting for you Mr Bond..."
Have you ever painted in Marmite? You need a pallette knife, some Marmite, curiosity and nothing better to do. ...to the F.I.S.H. playscheme in Guildford for providing fantastic play opportunities for my son this week and to his 1-1 helper in particular for all her energy and enthusiasm channelled into helping him engage. He LOVED it all week and I got to make a whole new bunch of Socklets. This is hers with card and chocs to say thank you, thank you, thank you!!!! Sometimes two identical sets of socks can turn out to be two identical socklets...but very rarely More often there are subtle differences in the end product, despite the imput seeming the same. Such is the case here, where these two turned out looking weirdly reminiscent of Ant and Dec. The computer game Pikmin has long been a favourite with my son. 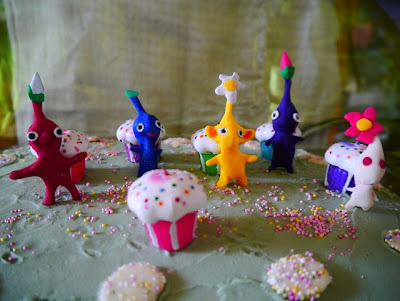 Two Pikmin themed birthdays have come and gone and he is still eagerly awaiting the third game in the series...which may well make THIS year a Pikmin birthday cake year too, by the time it comes out. This first one was make using rolled out icing and a tiny gingerbread man cutter. The first game had the little creatures in only the 3 primary colours. By the time the second game came along there were 2 new colour creatures, each with their own skills and uses. I made these from Sculpey, a kind of polymer clay like Fimo. Definitely NOT for eating! Or at least look at cake. I don't claim any great skills at cake making and decorating (as you will see), but no matter how old you get, its always nice to have a themed cake based on your current obsession. This was my daughter's cake a while ago after the Czech film Kooky came out and we watched it and loved it. Its a weird little treasure of a film and well worth seeking out (cert 12). Poor Kooky here is seeking shelter against a cruel world and inclement weather in the woods. It was only when we came to light the candles that I felt really bad, cos being stuffed with fluff and straw, Kooky is mortally afraid of fire and the picture looks like I've trapped him in his own shelter on purpose. No toys were hurt in the making of this blog. Fed up with building work taking forever? Want something fixed at lightning speed? Then call the NINJA BUILDERS. Silent, stealthy and speedy. They get the job done in an instant. This is more of a protest than a real threat...but this Socklet has declared his intention to leave home due to lack of take away pizzas. ...and will probably be back as soon as the contents of his suitcase run out. Every so often a craze sweeps over me and I make a particular something like there's no tomorrow. A while ago it was these organza flowers. A friend of mine was getting married and made her entire wedding bouquet from the ones she made in black and red. She taught me and the craze took hold. They are made from circles of organza fabric and the edges are held carefully above a candle flame until they curl and shrivel in the heat. When sewn together they make very individual flowers as you can never tell how each layer will turn out. The centres are made from pieces of jewellery I bought in Primark sales and took to pieces. Gadget Show...I need a pink Flamingo..Quick!! !